We’d love your help. Let us know what’s wrong with this preview of Star Wars by Chuck Wendig. It's true — all of it! The blockbuster movie jumps from the big screen to the comic-book page! It's been three decades since the Rebel Alliance destroyed the Death Star and toppled the Galactic Empire — but now, on the remote planet Jakku, there is a stirring in the Force. A young scavenger named Rey…a deserting Stormtrooper named Finn…an ace pilot named Poe…and a dark app It's true — all of it! The blockbuster movie jumps from the big screen to the comic-book page! It's been three decades since the Rebel Alliance destroyed the Death Star and toppled the Galactic Empire — but now, on the remote planet Jakku, there is a stirring in the Force. A young scavenger named Rey…a deserting Stormtrooper named Finn…an ace pilot named Poe…and a dark apprentice named Kylo Ren… Their lives are about to collide as the awakening begins. Writer Chuck Wendig (Star Wars: The Aftermath Trilogy) and artist Luke Ross (HERCULES) take us back into the saga of a lifetime! Perfect adaptation! Reading this i remember everything again! I am So ready to watch The Last Jedi tonight! There were a couple of really great panels/pages (eg Han’s death) but otherwise this was really mediocre and didn’t add anything to the story. Well, this is shot for shot, word for word, a rehashing of the film. I literally rewatched that two days ago and I was quoting along with it. So, by those standards, it's not really worth your time. I'm confused about the writing credit because everything is lifted from the script. The art is just okay. Finn and Rey look different in every single panel. The cover for issue 3 has a gorgeous shot of Poe. He's in agony but good lord, he is gorgeous! I enjoyed some of the emotion drawn in Poe's face Well, this is shot for shot, word for word, a rehashing of the film. I literally rewatched that two days ago and I was quoting along with it. So, by those standards, it's not really worth your time. I'm confused about the writing credit because everything is lifted from the script. I enjoyed some of the emotion drawn in Poe's face when he sees Finn's alive and in Finn's when he rejoins Rey on Starkiller Base. It's funny, I hear a lot of complaints about he book adaptation but that offered some extra scenes with Poe making his way from the TIE fighter wreckage and some flashbacks to Finn's life as a stormtrooper. This offers nothing extra at all. I'm not sure what the point is. The art is not really worth it. Yes, this is exactly the movie in graphic novel format. But you know what? I don't care. I thoroughly enjoyed this and loved seeing The Force Awakens in yet another form of media. The artwork is gorgeous (though there were a couple depictions of characters that could have been a little better). Would it have been nice to have a little bit of extra content? Yes. Was I disappointed that there wasn't? No. If you haven't seen the movie (you should, by the way), this is a great alternative. I didn't notice the reference to 47 in the movie, but I'm glad to see them here. Reading this comic is very similar to watching the movie, if you don't mind the missing special effects. As far as I can remember, there are no differences between the two, certainly as far as main events go, so it's only a matter of preference what you want to experience. You have old character and new ones, a fan-favourite is killed and a super-weapon is destroyed. You'll almost think this is A New Hope. It certai I didn't notice the reference to 47 in the movie, but I'm glad to see them here. Reading this comic is very similar to watching the movie, if you don't mind the missing special effects. As far as I can remember, there are no differences between the two, certainly as far as main events go, so it's only a matter of preference what you want to experience. You have old character and new ones, a fan-favourite is killed and a super-weapon is destroyed. You'll almost think this is A New Hope. It certainly is a start for a new and probably bigger story than the ones before it. Still, it has are plenty of weak moments that are lighthearted and fun. One of my biggest criticisms is that the lightsaber battles are a joke. (view spoiler)[Finn, a former First Order trooper, decides to break out Poe Dameron, a rebel who stashed a map to find Luke Skywalker in droid BB-8. Kylo Ren of the First Order needs that map to kill the last remaining Jedi. Finn and Poe crashland the Tie fighter on the surface of Jakku with the First Order on their trail. Finn survives the crash, but finds only Poe's jacket before the Tie fighter explodes. Finn arrives at Niima Outpost where the jacket draws the attention of BB-8, now in the company of Rey, a scavenger. They are soon attacked by the First Order and escape on a freighter. They get picked up by Han Solo and Chewbacca who now pilot a bigger ship. Han's dealing with some nasty gangs creates problems for him when they want their money back. They get away through sheer luck. While deciding how to find the remaining piece of the map DD-8 has, Rey is drawn to a lightsaber, one that belonged to Luke Skywalker and his father before him. The First Order commences an attack by destroying the Republic Senate and getting closer to recovering the map to Luke. Rebel fighters also get involved to tip the balance of the battle, but Rey is captured by Kylo Ren. Kylo Ren tries to extract the map from Rey's memory, but his memory torture technique is no match for Rey's natural force ability. How she is able to use the force mind trick without training kind of beats the purpose of the Jedi Academy or any force training. The First Order has another Death Star-type weapon named Starkiller powered by absorbing the full nuclear energy of a sun. The rebels led by Leia, together with Solo and Finn, need to destroy it. Han and Finn lower the shields laughably easily and reunite with Rey. Probably the most controversial scene in the movie was Han getting killed by Kylo Ren. Still, it's emotional. Even Leia feels Han's death. Kylo Ren doesn't die from the exlosions set up by Han to cover their escape and he pursues Finn and Rey in the most ridiculous lightsabre battle in existence. Finn has no training and faces Kylo Ren with relative ease until being overpowered. Then Rey basically humiliates Kylo Ren in a battle that is ended by the ground opening up u derneath them. Deus ex machina anyone? In my opinion, this comic book adaptation of TFA suffers from the same problem than the novel adaptation... maybe in worse: if you've seen the movie, it won't bring you anything new; and if you haven't (shame on you :-) ) you probably won't understand much. This comic was obviously written directly from the movie, and not from the script, so it sometimes spends a lot of time on some details that work in the movie (humour, some secondary interactions between the characters...), sometimes even tryi In my opinion, this comic book adaptation of TFA suffers from the same problem than the novel adaptation... maybe in worse: if you've seen the movie, it won't bring you anything new; and if you haven't (shame on you :-) ) you probably won't understand much. This comic was obviously written directly from the movie, and not from the script, so it sometimes spends a lot of time on some details that work in the movie (humour, some secondary interactions between the characters...), sometimes even trying to copy the movie almost shot by shot; but without the actor's intonation, the sounds, the editing, what worked in the film just doesn't on the paper. And then there's not enough time to treat the story correctly, so i'm almost sure that if you don't remember the movie well enough, you'll spend your time wondering 'what exactly happens there?'. Plus, the drawings aren't truly amazing (though i did appreciate a few unusually structured images, with characters half out of the box like they're caught in action, nice idea), so you don't even have that to save the whole thing. When I was a kid, comic book adaptations of movies were essential, because home video viewing was not yet available. The comic books and novelizations were the only way to go back and revisit those worlds. I very clearly remember the oversize comic book of The Empire Strikes Back—and how terrified I was of the scene where Vader tortures Han! Now, however, a graphic novel adaptation seems pointless. The only thing it might provide is an interesting visual interpretation that differs in some way fr When I was a kid, comic book adaptations of movies were essential, because home video viewing was not yet available. The comic books and novelizations were the only way to go back and revisit those worlds. I very clearly remember the oversize comic book of The Empire Strikes Back—and how terrified I was of the scene where Vader tortures Han! Now, however, a graphic novel adaptation seems pointless. The only thing it might provide is an interesting visual interpretation that differs in some way from, or adds to, the film. Or it could add content to fill in some of the gaps in the film. That would be interesting. The Force Awakens graphic novel, on the other hand, is entirely pointless. The artwork is haphazard and not at all stylish. And the content is literally nothing more than dialogue from the movie. Honestly, how does Chuck Wendig get a writing credit for this?? All he had to do was watch the movie and decide which lines to include and which to cut. Any fan could do that; and many could do it better than he did. It's great to see the story of Rey, Finn, and BB-8 in comic book form, but this adaptation delivers almost nothing new. The novelizations of the prequels--especially R. A. Salvatore's treatment of Attack of the Clones--added many new scenes; this is basically the movie cut and paste into a graphic novel. Hopefully, future Marvel adaptations will add more original content. Dialoghi interamente presi dal film. Nel complesso ottimi disegni. Even though this is almost a word-for-word adaptation of the movie it was still really enjoyable. The art is great and it made me remember how much I loved the movie. It would be cool to see a series with new events though just because I love these characters so so much and I need more!! Yes, it's pretty much a word-for-word adaptation of the film. But I NEEDED to read it. It's a quick Star Wars goodness fix! I don't remember when Marvel Comics published Classic Star Wars: A New Hope, I remember reading the Treasury Sized editions that reprinted the first six issues. Roy Thomas and Howard Chaykin delivered a lot of action paced story for a reasonable sum, and there was a lot to read on each page, I can't say that with this collection. I read this collection as individual issues and I feel confident in saying that there were more words in a single issue of Roy Thomas's Star Wars adaptation than in all I don't remember when Marvel Comics published Classic Star Wars: A New Hope, I remember reading the Treasury Sized editions that reprinted the first six issues. Roy Thomas and Howard Chaykin delivered a lot of action paced story for a reasonable sum, and there was a lot to read on each page, I can't say that with this collection. I read this collection as individual issues and I feel confident in saying that there were more words in a single issue of Roy Thomas's Star Wars adaptation than in all six issues of Chuck Wendig's. I don't know if this is because Wendig: 1. was constrained by corporate dictates; 2.
spent so much time telling the artist what to do that he forgot to add words to read; or 3. is a lazy hack. (if it's 3... well he's a lazy hack writing comics and I'm not). A wonderfully faithful interpretation of the film. The author and illustrator did an amazing job visually bringing the action of the film to life. You could almost see the illustrations in motion as you read. The emotion on the characters faces, and in their words, was intense and vividly recreated. Rey and Leia in particular were very well drawn. Some of my favorite scenes were in Maz's castle, Han's confrontation with Kylo Ren, and everyone's reaction, and the final panels when Rey finds Luke. A wonderfully faithful interpretation of the film. The author and illustrator did an amazing job visually bringing the action of the film to life. You could almost see the illustrations in motion as you read. The emotion on the characters faces, and in their words, was intense and vividly recreated. Rey and Leia in particular were very well drawn. Fair, as these adaptations go. Does a decent job of condensing the story, though I feel that a lot of the characters' depth got lost. The artwork really fell down for me. I felt like it lifted images and scene blocking directly from the movie, and just didn't really make use of the comic medium except for a few moments here or there. Loved the page with Han's "I used to be. ", and Maz's "Han Solo!" exclamation. Also Phil Noto's cover art is super pretty. *shrug* Pretty much as advertised. A decent adaptation, but as such, there's really not anything new here. I got a little more out of the novelization because you spent more time in the characters' heads than you can in the film. It didn’t add anything to the story it was just fine, if you didn’t watch the movie I think you would have been a little lost while reading this. But overall it was cool seeing it in this format. An underwhelming adaptation. 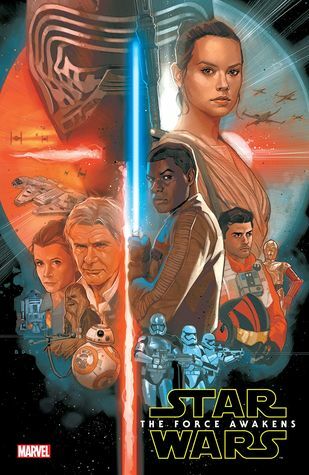 On my first read, I didn't notice any additions/differences to the story (which I suppose was an incorrect expectation for me to hold) and didn't feel like the artwork fit into the SW universe. This doesn't really add anything new, but I love this story. It was fun to experience it in a different format.